Starting out the month with a nice one. I thought it would top out at five bills but no, it got to $766 on some brutal bidding. Why the difference? IMO the arrow head wrist strap did the trick for an otherwise super nice full web glove. Hope the markings in the pocket are legible enough to show a brand. A mint 1940's MacGregor Goldsmith "Eddie Miller" glove sold for $400. The glove is no kids cheapo model. It is a nice all leather glove. It came with a miss-matched box. A near mint 1940's Military issue Rawlings "Bill Doak" model H glove sold for $256. Whole lotta gloves to catch up on. My favorite was this late '20's WD glove that sold for $400. The patent info on the face was a new one for me. It referred to curved stiffeners in the finger stalls to prevent hard hit balls from collapsing the fingers. Thought that was pretty cool and the glove itself was in nice shape. Love the tennis player logo patch! This S&D sewn web glove sold for $75. it's a youth model but in super condition. Didn't last long as a BIN. This crescent catchers mitt sold for $100. Thought it would go for more but had some flaws, i.e. replacement buckle strap and missing grommet web. I remember Murph stating, "if your going to collect anything , go mint"
A 1964 Spalding "Roger Maris" personal model 42-201 "Full Control Palm" glove sold for $164. Condition wasn't there but a rare glove. A Rawlings "Mickey Mantle" glove sold for $129. Normally a dime a dozen, this rare one was retailed through Sears, Montgomery Wards and has a telltale 60-4240 model number. The webbing is unique in that it resembles the MaGregor/WIlson gloves of the period. I think I wrote somewhere that 90% of the gloves made at that time were coming from one manufacturer. They could mix and match design elements with ease. A pretty beat D&M three finger glove and ball sold for $433. I liked the ball. It seemed authentic and was inscribed with the last put out of a 1937 minor league game in Washington state. [quote="mikesglove"]I remember Murph stating, "if your going to collect anything , go mint"
Agreed, Murph. You can't upgrade mint. Since I want darn near one of everything, I want the best example I can find or have. Once you get a mint one or one in the box, you can check it off your list forever. You never have to upgrade again. It's nice to stop looking for particular models. Once I box 'em up, they have a home forever. 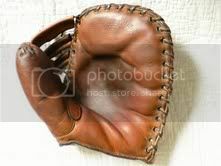 An early Spalding crescent sewn web glove sold for $950. A 1940's Ripon Ambidextrous glove sold for $2199. A mint Rawlings Tim McCarver catchers mitt sold for $599. Its the "Big Wheel" HOH model. A white sewn web Goldsmith "Carl Mays" model XL glove sold for $835. A very rare glove showing light use. Unfortunately the previous owner personalized the back with some ink and holes in the wist strap. A trap web Spalding "Babe Ruth" "Home Run Special" glove sold for $865. A pretty nice glove desperately in need of a stint in rehab.